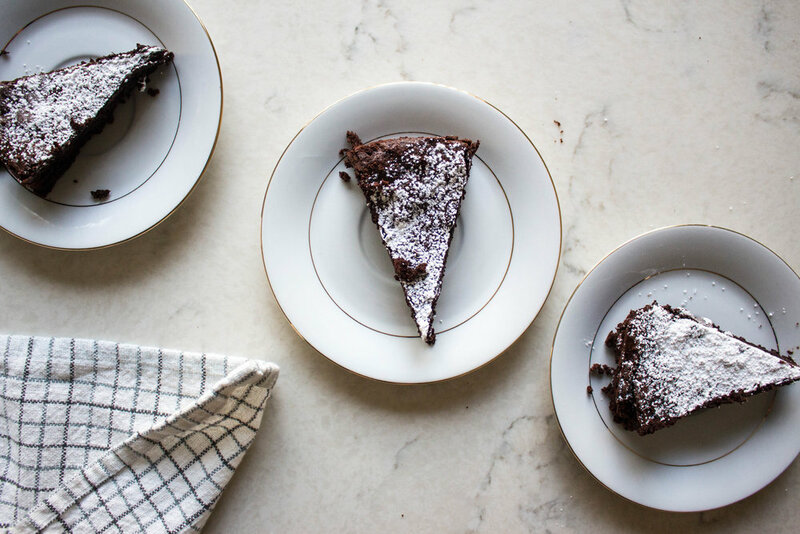 how does one photograph flourless chocolate cake? i'm having trouble because my photos look flat and boring. literally, dark, dark, dark triangles, white plates, white powdered sugar, and an off-white surface. how do you make this look artsy? maybe that's it- i need new plates. maybe some gold forks. also maybe a new backdrop. just kidding, i really don't need anything else, i've taken over the entire kitchen at my apartment already. as c tells me all the time- "you just need jesus." truth. speaking of apartments, when i was in college, my apartment was literally a five minute walk from trader joe's. yet, when i ran out of ingredients, i was too lazy and cheap to refill that ingredient, so i'd bake depending on what i already had in the kitchen. i'd start googling "substitutions for ____" or "dessert without ____". fast forward five years, and i'm still doing the same thing. i ran out of flour but i really just wanted cake. also i was seeing my friend k that same day, and she has celiac disease, so i wanted to make something without flour. k, if you're reading this, this one is for you. 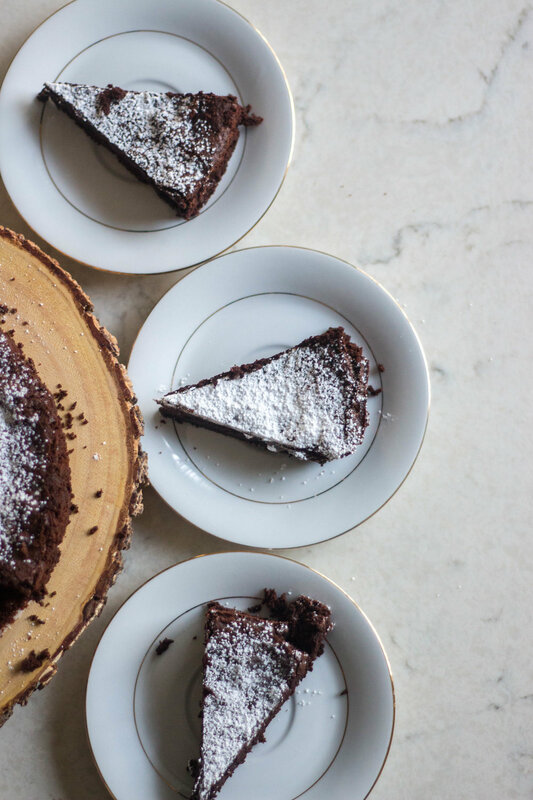 lo and behold, a quick google search brought me here- a flourless chocolate cake, which required ingredients that i already had in my pantry and no flour!! this reminds me more of a very fudgy brownie. it's rich and super decadent, and it melts in your mouth. most recipes top this with a chocolate ganache, but that's a little too over-the-top for me. i'd go for the powdered sugar dusting, or if you're up for it, fresh whipped cream or a la mode with vanilla ice cream. and if you're out of any of these ingredients, make a quick run to the store...or if you're like me, google away. baker's notes: let's talk about dutch-processed cocoa. i'm not great at explaining the science behind it, so i'm just gonna let the web explain it to you. read here and here. I used to be super stingy about buying a different type of baking cocoa, but i do think the chocolate flavor and color is much deeper with dutch-processed cocoa. i bought mine at sprouts, but If you don't have any, unsweetened cocoa is just fine here. preheat oven to 375 f. lightly grease an 8- or 9-inch round cake pan. line the bottom of the cake pan with parchment paper, and set aside. place the chocolate chips and butter in a large microwave-safe bowl. microwave in 30-second increments until the butter is melted and the chips are soft, stirring after each interval. Stir until the chocolate chips melt. stir in the sugar, salt, espresso powder, and vanilla. make sure the mixture isn't too hot, and add the eggs. beat until smooth. add the cocoa powder, and stir to combine. 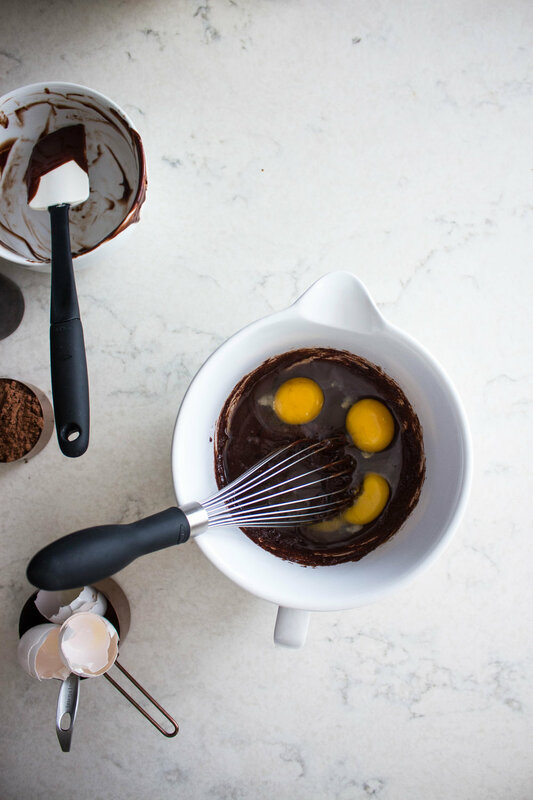 pour the batter into the prepared pan, smoothing off the top of the cake. bake for 25 minutes, until the top of the cake looks dry and has formed a thin crust. cool the cake in the pan for five minutes before flipping it out onto a platter or wire rack. let the cake cool completely before dusting with powdered sugar. if it's a la mode, slice and serve warm, with ice cream!